So…What’s the POINT of THIS BLOG? Some time ago I shared a post called Advice from a few “old hands”. 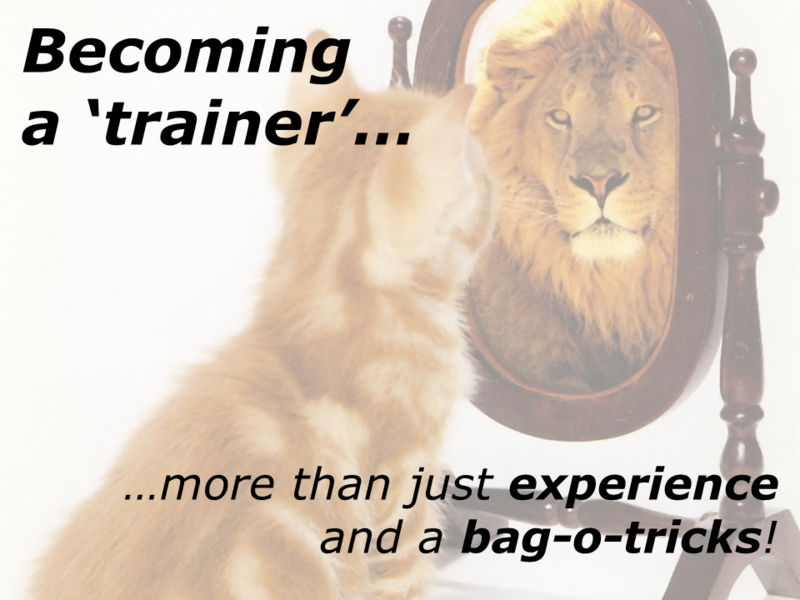 This was a follow-up to some earlier posts written (primarily) for “teachers” (and their “trainers”) going through the transition to “trainer” – and suggested a workshop activity designed to help trainers-in-training imagineer their own “trainers creedo”. Recently, I was working on such a programme with Karabük University – in the Black Sea region of Turkey. The programme was for a small team of largely younger teachers – and was designed to upgrade their classroom LEARNing and TEACHing abilities and also introduce them to the world of “teacher training”. Most of the teachers on the programme were a little apprehensive about the teacher training components of the programme. 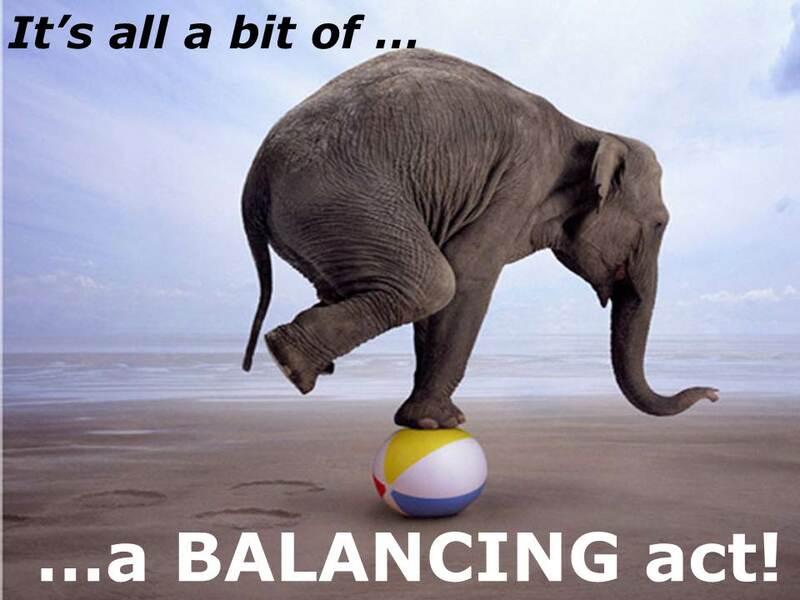 It is a huge step for younger teachers to start thinking about becoming a teacher trainer – especially when they are still “LEARNing as teachers” themselves (…do any of us really stop)? Because of this, the team of trainers looking after the programme placed a great deal of emphasis on combining “reflection-on-teaching-practice” with “reflection-for-training-practice” – as well as a focus on values, walking-our-talk and LEARNing-by-doing. I was lucky enough to coordinate most of our introductory sessions on training, becoming a trainer and designing and planning workshops – by far the most interesting was “managing the transition” and I used the activity I described in the post above. What happened during this session was a great LEARNing experience for all of us – and also touched on how we use assessment/grading on training programme and how we give feedback to teachers. I asked one of the participants, Esin, if she could write up her reflections on the session to share with other trainees-in-training for the blog. She did – so, read on! Most of us were quite nervous about the sessions on ‘becoming a trainer’ – we thought that they would be just too high-level for us and that we were not ready to make the move into teacher training. We still have a lot to learn but our trainers really made us explore our own classrooms (as teachers), look at what we do (as teachers) – and apply this to what trainers do. We quickly realised that the jump was not as big as we all had thought. However, in one session Tony began talking about “Pirates” and we thought this was funny as we all love Johnny Depp (as does Tony’s wife, we discovered – he prefers Johnny’s wife)! 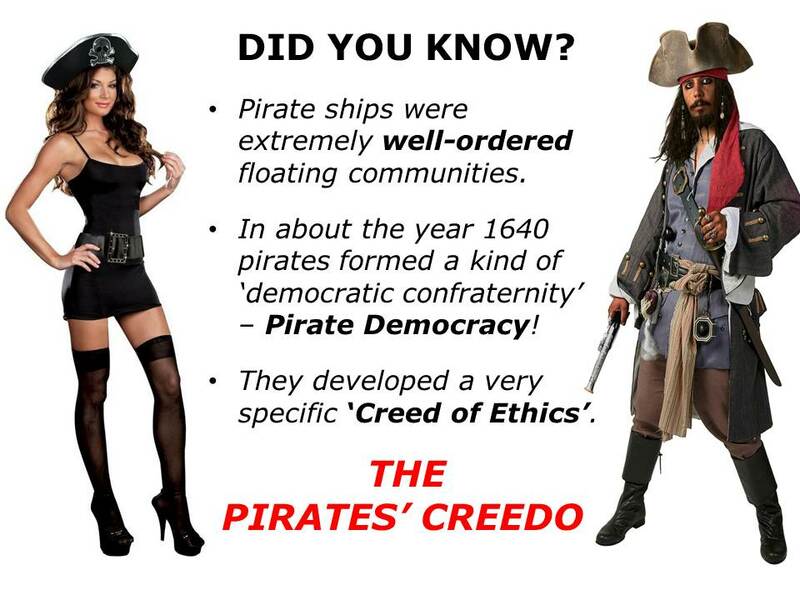 We thought pirates did nothing but steal, kidnap and murder – but he told us about the “democratic principles” that a lot of pirates had over 400 years ago – and we looked as some of the “values” they built into their “Pirates’ Creedo”. It started to make sense…well, a bit! 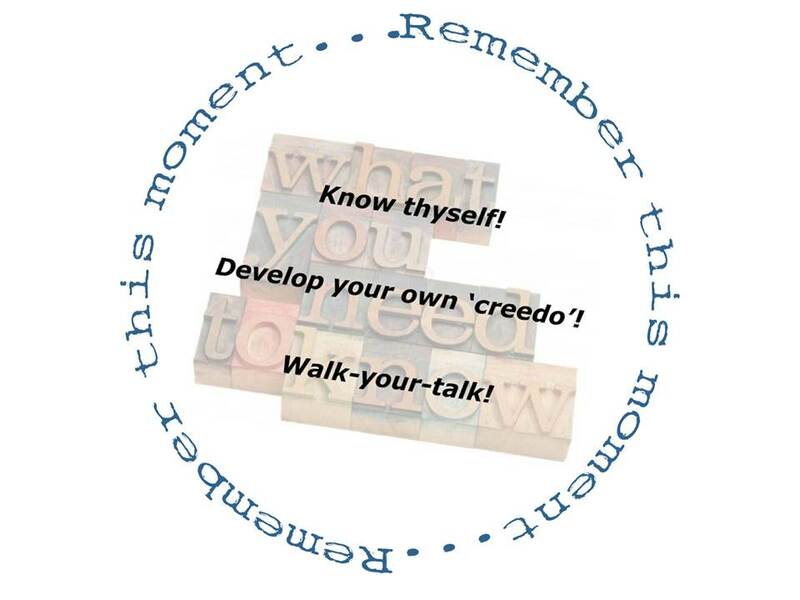 Then he told us we were going to create our own creedo – a trainer’s creedo! We took a look at some really great advice from some old hands in teacher training – and were happy to see so many of the things we had already agreed that teachers need to do in their classrooms. Then, we all thought about our priorities and chose our own top 8 elements individually – this was difficult as all the advice was great. After that, we all got into goldfish bowls (yes, we learned about these, too) and shared our ideas with our group. The problem was that we also had to convince others in the group to accept our ideas – this was much more difficult. But, we managed it. It was really nice to see that others could accept different ideas and that we could reach agreement despite there being a lot of different points of view. What was interesting was that we really had to justify our choices to convince others in the group. This meant we really had to think deeply about what is behind the advice we give others and what is important for both teachers and trainers. We were so proud of ourselves! Then, our trainer asked us to do something strange – he asked each group to grade each other’s posters. It was the first time we had done something like this – and what happened then shocked us all. 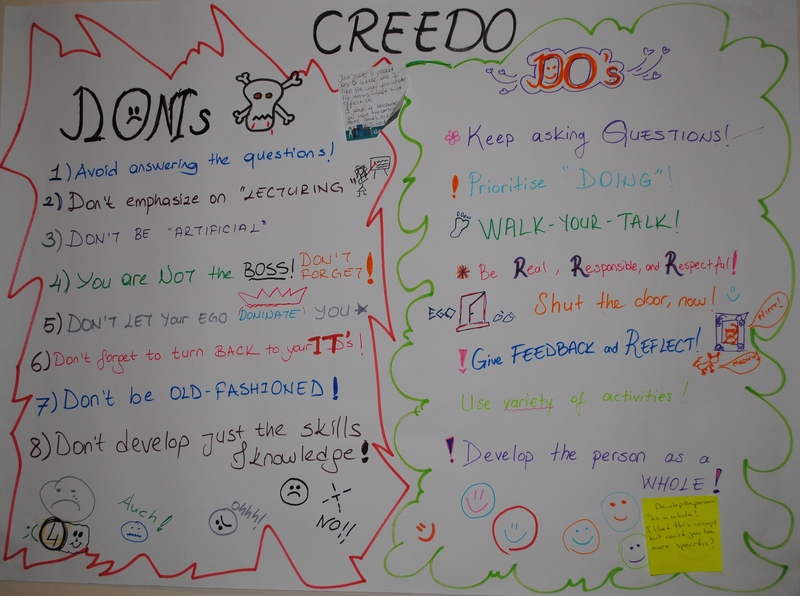 We graded the posters – but what we didn’t realise was that there was a different creedo guiding how we did this. It may sound funny (as we are teachers) but all the groups obviously thought they had done the best job – and we gave low marks to others because of this. When the groups returned to their own posters, suddenly everybody got a bit annoyed because we thought we deserved much better grades. To calm things down someone suggested that it might be a good idea to explain the reasons behind our grades – and use post-it stickers to add our feedback to the posters themselves. We had been talking about giving feedback to teachers and it seemed like a very good idea because everybody wanted to know why they got that grade they had been given. However, when we were writing down our feedback we discovered that we were actually doing something that could make the situation worse. What we started to do was list all the points we didn’t like – and wrote notes highlighting the mistakes and errors on the posters. A few of the post-it notes were actually a bit cruel – still we were trying to make the point that our posters were better and justify our low grades. 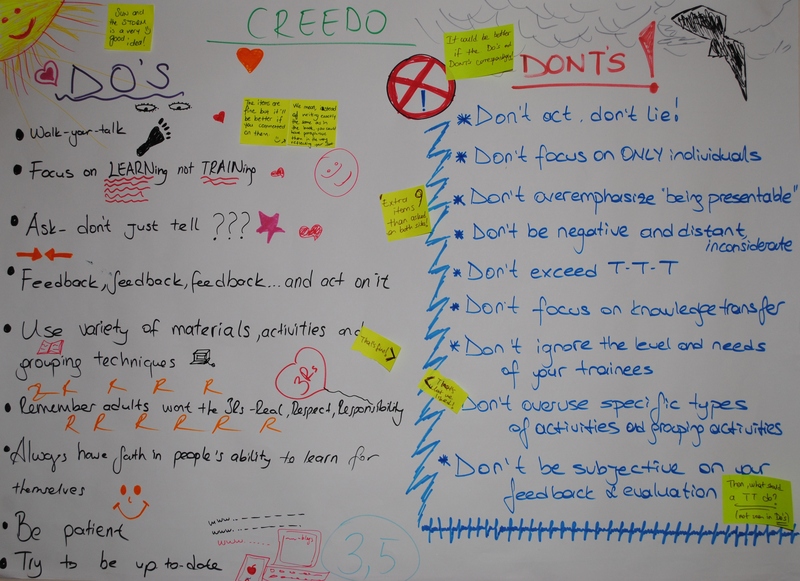 Our trainer then stepped in a made a few suggestions – he highlighted some of the words and phrases we had put on the posters and asked us to think about whether our post-it comments “matched” the things we had included in our creedos. What did I LEARN from all of this? 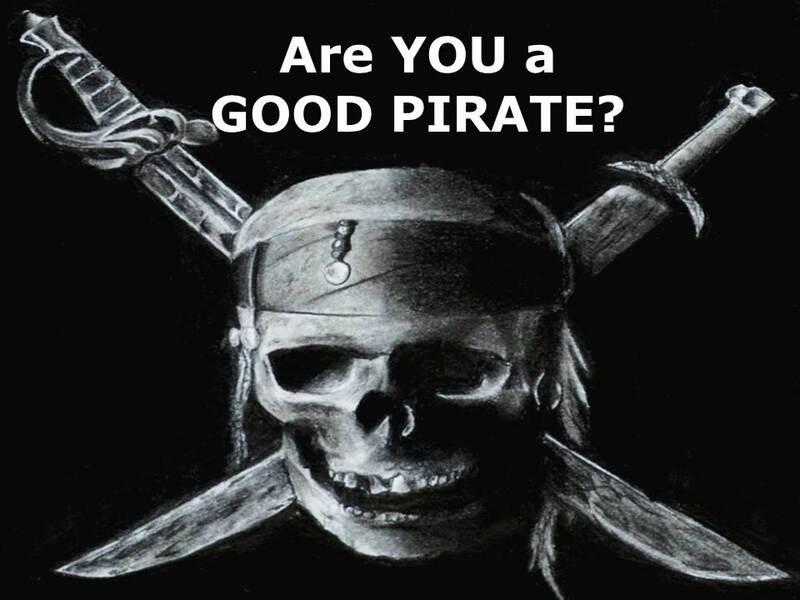 Well, participating on a train-the-trainer programme can be stimulating (and tough at times), talking about pirates can be surprisingly informative and doing a cool poster can be fun – but what matters is what we do with what we LEARN and how well we “walk-our-creedo” (both as teachers and trainers). Is the Global Scale of English (GSE) Really the “Love-Child” of Lucifer and Empusa? How to Spot and ‘Nail’ an EDUfraud! So…What Exactly Should PD Look Like? Is ELT ‘Broken’? – Part 01: Is it the training or the trainers? Is the Global Scale of English (GSE) Really the "Love-Child" of Lucifer and Empusa? Hocam, Kaç Saatte İngilizce Öğreniriz?